Frank Martell concludes his study of the Vanguard system—“the most important organizational advance since hierarchy.” Read Part 1 here . 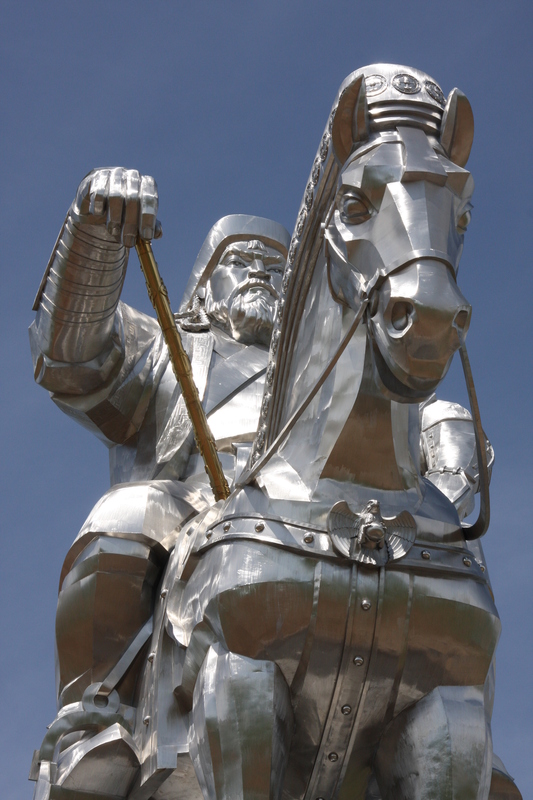 Under Genghis Khan, the nomadic Mongols, approximately two million strong, were united into a nation for the first time in history. They conquered most of the 60 million-strong northern Chinese Kin Empire, Turkestan, the Khwarizm Persian Empire, Iraq, Syria, Armenia, the Ukraine, and southern Russia. After the death of Genghis, the Mongols went on to complete the conquest of Kin, then took the southern Chinese Sung Empire, with its 80 million inhabitants. Expanding in all directions, they also seized Palestine, Turkey, Russia, Romania, Hungary, Poland, Silesia, Bohemia, Austria, Afghanistan, and India (where Mongol rule survived until it was broken in the eighteenth century by the British). The nominal leader of the invasion of Europe was a royal descendant of Genghis Khan, but the real commander was his Chief of Staff, Sabutai. Selected personally by Genghis at the age of thirteen for the Orkhan, Sabutai was an Orlok (army commander) during the invasion of Persia by the time he was twenty-three. 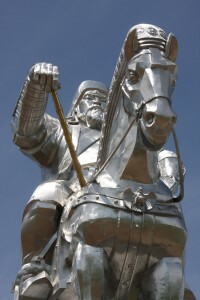 As soon as that campaign had ended in victory, Genghis gave Sabutai 20,000 troops and sent him on a three year reconnaissance in force into Europe. During the course of this devastating raid, he smashed the armies of the Arabs, Armenians, Kumans, and southern Russians before returning to Samarkand to make his report. More than fifteen years later, long after the death of Genghis, the Mongols decided to take Europe. Sabutai was made Chief of Staff. He divided his army into three wings. The main force was aimed at Vienna through Hungary. The northern wing of 50,000 destroyed the combined armies of Poland and the Teutonic Knights. The central wing, numbering 75,000, destroyed the combined armies of Saxony and Bohemia. The main force of 100,000 destroyed the combined armies of Hungary and Austria outside the walls of Vienna. The Mongols were outnumbered in each one of these battles and yet won decisive victories against courageous resistance (the Teutonic Knights, for example, refused to surrender and had to be killed to the last man). Europe was saved only because the Mongol Emperor died and, under the Yasak—the written Mongol constitution—all nobles and high commanders had to return to Mongolia to elect a new emperor. The Mongol Horde disappeared from Europe as quickly as it had come, leaving only a 60 mile-wide swath of scorched earth from the Baltic to the Black Sea to mark its exit and cover its withdrawal. Fortunately, the Mongols never returned to the project. So how can a small political party apply and gain from the principles outlined in part one of this article? We must start simply and set ourselves realistic steps by which to reach our ultimate goal of a permanent Vanguard school, which would select and develop unorthodox young minds, and place them as officers into the party bureaucracy. The first step is to recruit a handful of bright young activists and educate them through weekend academic programs. They should be trained and given experience in every aspect of the party’s field and staff work. In each aspect they would work closely with the best senior official, who would he responsible for teaching them. Field work would be learned from key members of the branches which have had proven success with the techniques in question, whether canvassing, door-to-door paper selling, community politics and so on. In regard to staff work, they would rotate quarterly with those officers responsible for the four main functions of every political party: Operations and Planning; Publicity and Theory; Finance and Administration; and Commercial Operations. The following year they would rotate quarterly through different branches, with each coming to know well the assets and liabilities of the four branches, and learning the functions and problems of the branch officers. To round out their training, the Vanguard class could be brought together in a Special Action Team to accomplish an assigned goal. For example, they could be made to spend six months or a year building a new branch to see how difficult this really is, or they could be given the task of developing a youth newspaper, or of setting up a self-supporting business which would benefit the party in some way. On at least one weekend every month, the Vanguard cadre would come together for study. They would learn ideology (communist, capitalist, and nationalist), political and revolutionary history, strategy and tactics, and the principles of leadership and management. They would be trained to speak and write well, with many sessions and exercises devoted to formal and informal speaking, as well as to the production of printed and electronic propaganda. They would learn through lectures, gaming, and practical activities. The gaming would center around difficult political situations, the likes of which they will actually encounter in their later careers, and in which they would play different positions in the party or enemy leadership. The controllers of these “games” would change the situation to challenge the players to draw out how each reacts under mounting pressure. For example, the trainees would he split into two groups and briefed on some event which posed a great danger or opportunity for the BNP. “An emergency party leadership meeting is called. Examine the options open to the party and outline the advantages and disadvantages of each. Select a course of action and detail how to put it into effect.” The controllers of the game would review the written answers and update the situation with new “facts,” increasing the pressure hour by hour. The game would continue in this vein until time ran out or until it reached its logical conclusion. The controllers would then bring the two groups together and critically review their approaches. Obviously, there would be no winners or losers per se, but the controllers would suggest an approved solution for the guidance of the students. These weekend study sessions will need to be both constructive and recreational, as they will be continued over years. Free time should be taken up with sports, or with board or computer gaming, such as Diplomacy or Crusader. Pub time can be useful for free discussion, but alcohol use must be discouraged. We must remember that manners, good grooming, proper dress (shirt and tie) when among the public, and no drunkenness, are what impress people at large, including the working class, in the long haul. Ultimately, the party will need to establish a permanent Vanguard School. This will prepare the future leadership both for the struggle to take power and to lead well once the reins of government are in our hands. This will require leadership education and training in all of the above areas, plus in the making of sound political, economic, and military policy. This is a course of study which, if carried out correctly, will involve years of effort but will result in the most sophisticated political leadership in the world. To end with a summary of the Vanguard System: Ability is a combination of intellect, drive and education, and has little to do with seniority. The brilliant British military theorist B. H. Liddell Hart wrote that a man who relies upon what he has seen is needlessly limited, whereas a man who reads can benefit from the experience of thousands. Napoleon was a great captain before he saw his first battlefield, because he had spent his life preparing for that moment—reading about war and thinking about war incessantly. This is the spirit of the Vanguard—the participant is constantly learning, and he is ever ready to teach what he knows to his subordinates. He is excited by his study, and is determined to discover the historical principles that apply to his life’s work. The Vanguard System finds those with this spirit, structures their education for high-level leadership, and then elevates them rapidly to those critical positions from which they can do the most good for the movement. The system is intolerant of incompetence, and will assign each individual to his or her proper station, whether that means promotion or demotion. The Vanguard System enters talent laterally into important decision-making posts, whereas in a conventional bureaucracy talent is forced to work its way up the ladder, wasting its best years doing jobs that others can do and often being burned out in the process. Climbing the bureaucratic ladder does not at all prepare one for the sort of decisions that must be made at the top. The Vanguard System institutionalizes top-level quality leadership, and is truly meritocratic as it does not respect seniority as self-justifying, and all who take part in it recognize the personal risk that such a system entails. Its accomplishments to date prove that it is the most important organizational advance since hierarchy. Yet, for a variety of ideological, temperamental, and personal reasons, none of our political opponents can adopt it. We can, and we must. Spearhead, no. 353, July 1998, pp. 20–21.